Baxter Building Ep. 32: "Can't We Just Call It A Day?" - Wait, What? Previously on Baxter Building: Sue Richards no more! 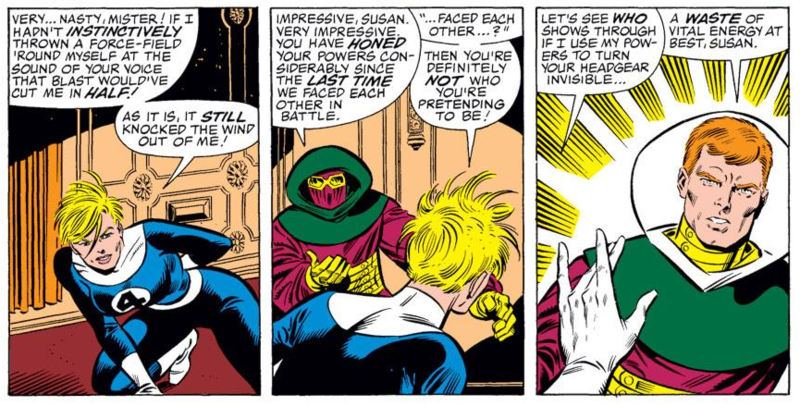 No, wait; I mean Invisible Girl no more, because after facing off against Psycho-Man and the Hate Monger, Sue has become the Invisible Woman because she did… something mysterious off-panel…? Oh, and John Byrne is running out of steam and then some as we speed towards the end of his run. 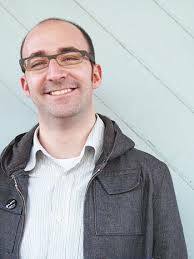 Important Note: There is an increasing amount of static on Jeff’s side of the call from about 20 minutes in until about 40 minutes in. We’re sorry! I’m also sorry these show notes are up so late: Blame work deadlines and me disappearing to see the eclipse. 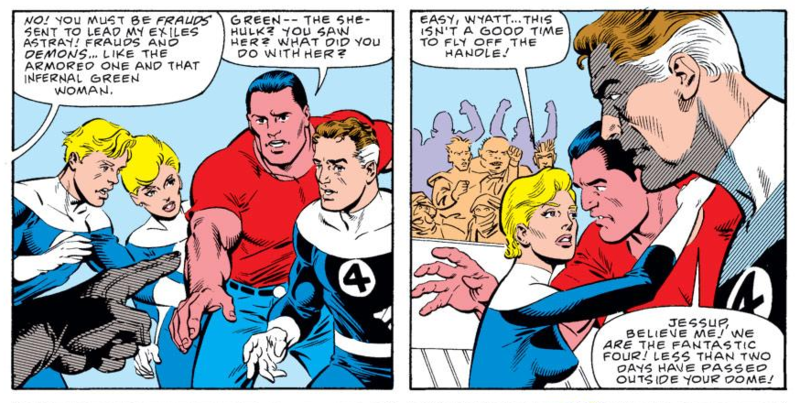 0:06:24-0:24:18: …Fantastic Four #285, in which John Byrne clearly thinks that he’s producing a work of deep emotional value, despite it being a clumsy, cloying self-satisfied mess. While it’s obvious what he was going for, the lack of… well, any real emotional value whatsoever in the story, combined with an impressively misguided attempt at an uplifting ending, collides to make a disaster of an issue. Did Tommy die for nothing? Well, it depends if you consider “John Byrne’s ego” to be nothing, but basically, yes. 0:24:19-0:42:40: FF #286 brings Jean Grey back to life in an X-Factor prologue that manages to get over quite how boring those initial issues of that series was, while also bringing in a couple of uncredited guest creators so upsetting to John Byrne that he takes his name off the book. As you might expect, Jeff and I were both thrilled by an issue that evokes the spirit of Bob Layton, but even as we try to ignore the static, we imagine how patient Hercules must be when he’s not sexually harassing the women around him, discuss the apparently terrible memory the Avengers and Fantastic Four have for faces — they have met Jean Grey before! — and Jeff touches on why this comic makes him feel for Brian Michael Bendis. No, really. Also! Are godlike beings restricted by history? Does anyone besides me miss the Watcher about now? And is “John Byrne, Continuity Cop” actually a good thing…? Seriously, what were you thinking, John Byrne?!? The worst part? There’s a really good idea at the heart of this story, as we riff about momentarily. Don’t make us do your job for you, Byrne…! 1:26:42-1:45:36: But, wait! Could Fantastic Four #s 291 and 292 be even worse than the previous couple of issues? It’s not impossible, but before we get there, I share a theory about whether or not Byrne was phoning these issues in because he had actually quit Marvel a year earlier. From there, it’s all talk of repetition, Star Trek rip-offs and whether or not a plot about Nick Fury traveling in time and planning to kill Hitler years before World War II would actually be a big deal or not had someone else been working on the book at the time. Does it matter? Of course not, because we are trudging through the very end of an era here, and it’s not pretty. 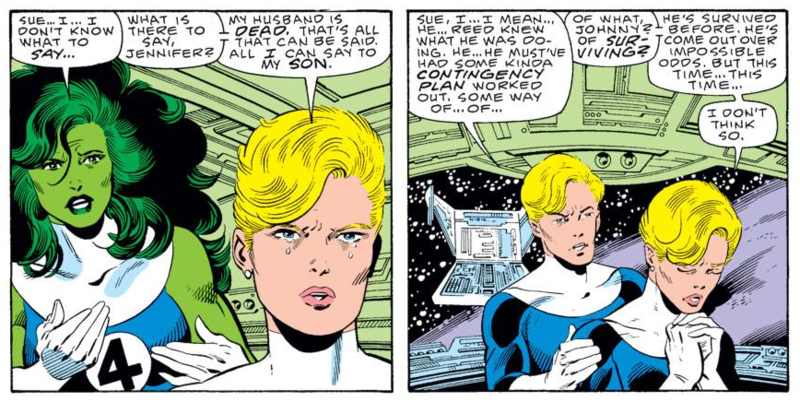 1:45:37-1:51:18: Okay, Fantastic Four #293 is actually the end of an era, being that it’s John Byrne’s final issue — and, in great Fantastic Four tradition, it’s the first part of a storyline that he won’t get to finish. If you’re hoping that means he’ll get to finish in style, then… well, prepare to be disappointed with an issue that barely features the FF, and in fact kind of feels more like a West Coast Avengers fill-in… Still, our long national nightmare is over. Kind of. 1:51:19-end: Things devolve slightly as we tackle FF #294-295, the first Byrne-less issues of the series in five years by… kind of ignoring the story and concentrating on comparing how temporary replacements Roger Stern and Jerry Ordway did in comparison to what had come before. (Spoiler: Just because they seem to care about the work, it feels like a step up, although Byrne was arguably more talented than either?) We also talk about what John Byrne did next, our secret plans for a John Byrne podcast and look ahead to what’s upcoming in the next Baxter Building — #206-304 — and what’s coming in the next Wait, What?, because the answer is, somewhat surprisingly, more John Byrne. Even more than usual considering the audio problems, thank you for listening and, considering how late this is going up, thank you for your patience in reading. We’ll do better next time! Honest! By the by, you overestimated Layton’s duration on X-Factor – he lasted only 5 issues and Louise Simonson had to go to considerable lengths to correct what he’d done (the Cyclops/Pryor split, the mutant hunter angle). I could have sworn it wasn’t the Watcher, but Dr. Darling who explains to Johnny how much Tommy’s life was enriched by the Human Torch. 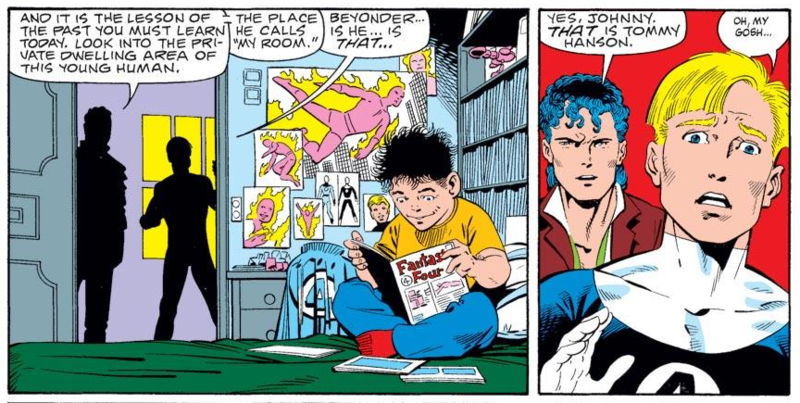 I remember Byrne saying on his AOL boards back in the day that having the Beyonder actually show proof of Tommy “Living” Takes way from the power of the story, and Johnny having to trust Dr. Darling’s word was more powerful. The Torch story was picked by Marvel readers as the #40 story, of the top 75 Marvel stories from 75 years of Marvel Comics. It was included in the Marvel: 75 Years Omnibus. The other FF stories chosen were FF #1 and the Galactus Trilogy – FF #’s 48-50. The only other FF story to rank in the top 75 (but not included in the omnibus was FF #262 – The Trial of Reed Richards. I find that profoundly depressing. Danny Fingeroth’s story in FF#342 about a similar subject was much better. That doesn’t mean it was good, but it was better. When I was reading these a few months back, via FF VISIONARIES volumes from the library, I was just stunned by how bad #285 was, and then doubly stunned when I googled around and saw that some people considered it a highlight of Byrne’s run. It took me a week to get back to reading FF, and it all seemed so half-baked and lifeless, eventually I just had to give up halfway through the “time-travel” story (and I am not shocked to hear that the resolution of that story was so ridiculous). Maybe someday I’ll finish up, but not for a while. Geez, Graeme, you already forgot that the both of you reading Star Brand was my idea? Yeesh. Apology accepted about the sound, even with my kinda impaired hearing I could hear everything you guys said. In fact, I’m a little curious about a repeated sound like several small objects being dropped on a desk. Was one of you rolling dice? 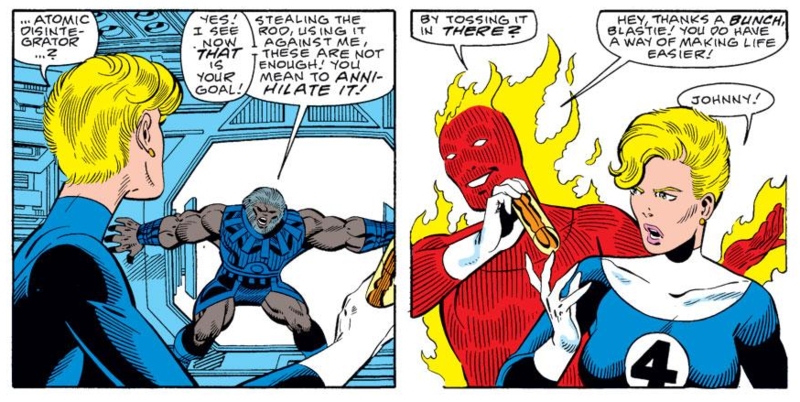 Frankly,even knowing you’re going to do an episode on Starbrand, Byrnecast is a terrifying thought. Don’t gaze into that abyss. Sure, it’ll be jolly romps reading Rog 2000, but in the end you’ll have to read his Galactus versus Darkseid comic, about which I only remember I didn’t pay full price and I still felt disappointed and resentful after reading it. I’ve what I feel is an odd affection for Gruenwald’s Quasar. He seems concerned to be writing what he conceives of as a good comic in a professional manner. Roger Stern, while more to my taste is somewhat similar. In neither case do I ever feel that their passions will run away with the story. Byrne’s passions seem so evident in his stories sometimes with good results and more often not. They do bring out more profound reactions in me than his more temperate colleagues. I think it may be this aspect that leads to #293 being his last issue of FF. Imagine the elements of #294, an inbred community with a senile government who worship a frozen image of the Fantastic Four which rejects all possibility of change executed with the featherlight satirical touch of the man who gave us the fate of Sunspot in Legends. I’d like to see that original plot synopsis.